Sometimes there is nothing better than a refreshing margarita. 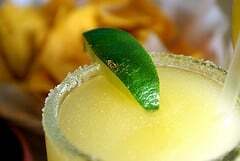 You can enjoy a Rio Bravo Real Margarita at home. You don’t need to buy a mix, you can make better tasting drinks with fresh ingredients. Place all in a mixer, and blend until smooth. We all know that Margaritas are wonderful! So these fall in line with most Margaritas! They are very good!